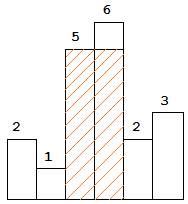 Given n non-negative integers representing the histogram’s bar height where the width of each bar is 1, find the area of largest rectangle in the histogram. 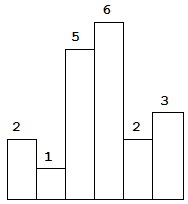 Above is a histogram where width of each bar is 1, given height = [2,1,5,6,2,3]. The largest rectangle is shown in the shaded area, which has area = 10 unit.